Earners of this certificate will have a deep understanding of hospitality and tourism operations including: food and beverage, law, front office procedures, finance, accounting, marketing, and management. This certificate is offered in partnership with the American Hotel and Lodging Educational Institute (AHLEI), providing a stamp of approval from the American Hotel & Lodging Association (AHLA). 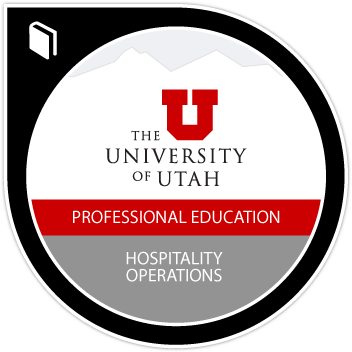 It is recognized by hospitality employers as evidence of competency in hospitality knowledge. Completion of 15 week online course Introduction to Hospitality and Tourism including all exams, projects and other assignments required of for-credit students. and as part of the AHLEI curriculum. AHLEI course materials and exams utilized. Completion of 15 week online course Food and Beverage Service including all exams, projects and other assignments required of for-credit students. and as part of the AHLEI curriculum. AHLEI course materials and exams utilized. Completion of 15 week online course Hospitality Accounting including all exams, projects and other assignments required of for-credit students. and as part of the AHLEI curriculum. AHLEI course materials and exams utilized. Completion of 15 week online course Front Office Procedures including all exams, projects and other assignments required of for-credit students. and as part of the AHLEI curriculum. AHLEI course materials and exams utilized. Completion of 15 week online course Hospitality Supervision including all exams, projects and other assignments required of for-credit students. and as part of the AHLEI curriculum. AHLEI course materials and exams utilized. Completion of 15 week online course Hospitality Law including all exams, projects and other assignments required of for-credit students. and as part of the AHLEI curriculum. AHLEI course materials and exams utilized. Completion of 15 week online course Food and Beverage Management including all exams, projects and other assignments required of for-credit students. and as part of the AHLEI curriculum. AHLEI course materials and exams utilized. Completion of 15 week online course Experience and Service Marketing including all exams, projects and other assignments required of for-credit students. and as part of the AHLEI curriculum. AHLEI course materials and exams utilized.